Capnography is becoming recognized as a critical component of patient monitoring. Capnography is the measurement of carbon dioxide concentration within exhaled gases, and serves as a monitor of partial pressure in the arterial blood. Paramedics and medical professionals utilize capnography monitoring to ensure that respiration remains steady during intubation and during anesthesia – a rise in the ETC02 levels can be an indicator of hypoventilation, drops can indicate hyperventilation. Particularly in critical care environments and with patients who have pre-existing respiratory issues, a capnography monitor can prove to be a life-saving tool by helping to diagnose these issues swiftly. Capnography was once something limited to only the ICU, but this capability is now available in a consumer product. The LifeSense Tabletop Capnography and Pulse Oximetry Monitor is one of the only products available which allows for continuous EtCO2 monitoring in a compact package. Engineered by the experts at Nonin, the LifeSense Monitor provides accurate EtC02 and Sp02 monitoring in seconds – a key component in critical care situations. In addition to accurate monitoring of EtCO2 on the first breath, the LifeSense monitor offers a widescreen, touch-panel display with continuous monitoring and waveform display, allowing accurate readings down to the second. This waveform is monitored for 4 hours with trending monitoring, giving medical professionals the data they need to make accurate decisions regarding the care of their patients. The widescreen display also delivers numerical data display through its backlit LCD, with both audible and visual alarms, offering an unmatched level of monitoring and making it easy for medical professionals to access that data. Data can also be exported via RS-232, offering yet even more capability to this device. Effective for both intubated and non-intubated patients, the LifeSense Tabletop monitor is the ideal tool for critical care EtCO2 monitoring. From gauging the efficiency of CPR to verifying tube placements, this compact tabletop monitor is the ideal tool for patient monitoring. It combines the functions of both a full-fledge capnography monitor and pulse oximeter into one convenient, useful device. 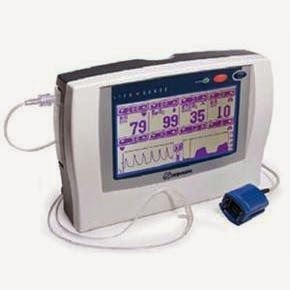 Learn more about the LifeSense Tabletop Capnography and Pulse Oximetry Monitor, and other monitoring tools for respiration, at Concord Health Supply today!